OPEN M-F 8:00 A.M. – 5:00 P.M.
Great job! My car had a horrible crease in it. Dent Pros Omaha was upfront and honest with the potentials of what could happen, as they did not want any surprises. Thankfully, none of the worse case scenarios applied and my car looks like new again! Also, they were willing to come to my house, which was extremely convenient! Nathan with the Dent Pros Omaha did a FANTASTIC job on my door dent left by someone else's car door. I texted him a picture of my door and got a speedy estimate. He came and restored my car the very next day all while I was at work! 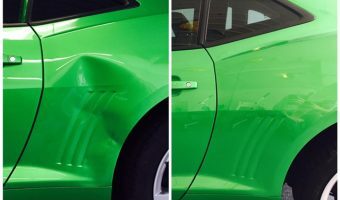 He was very informative, professional, and did a great job at a fraction of the cost I would have paid in a body shop. Definitely recommend him! Nathan was out to fix my dent fast and made it back to normal in no time!!! Would highly recommend!!! Very happy!!! Thank you! Nathan did an awesome job on my car. He responded quickly, came to my house and the job was done and over. Very professional, I would certainly recommend and would use his services again! I called Nathan Friday at 430 and he was at my home Saturday at 930. Very professional and punctual. Very satisfied with work he performed. He also traveled an hour to my home. Thanks again Nathan.